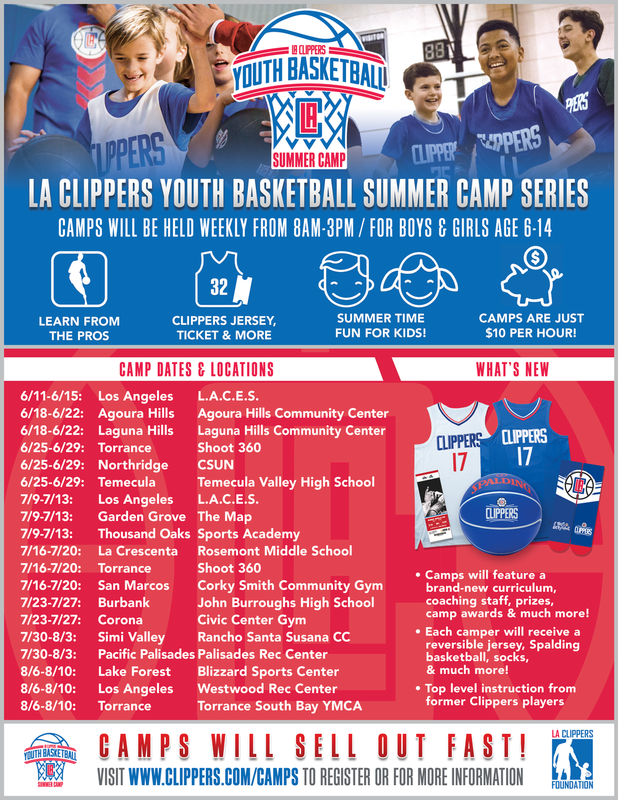 Register Your Kids for LA Clippers Youth Basketball Summer Camps! LA Clippers Basketball Camp for Kids! Friends, Benny is not six-years-old yet... But if he was, I know where I'd be dropping him off for a week this summer! The LA Clippers Youth Basketball Summer Camps are back for another year with 18 locations to choose from in and around Los Angeles! The LA Clippers Youth Basketball Summer Camps is an inclusive, high-energy camp used to focus on the fundamentals of basketball and to help children of ALL skill levels improve their game. The goal is to improve each participant’s basketball skill level in a fun environment! The 5-day camps will feature a brand-new curriculum, coaching staff, prizes & camp awards to all participants! Kids will get top level instruction from former Clippers players! Each camper gets a reversible jersey, custom Spalding basketball, socks a FREE Clippers ticket and other gifts. 2. Register your child, ages 6-14. You will be required to provide contact information. 4. Get ready to watch your kids develop their skills on the court! Parents are allowed to stay and watch practice! Let's help our kids engage with other children in a fun basketball setting, fellow parents! Like I said earlier, Benny is too young to participate but I hope we show our very own LA Clippers enough support to return next year with more summer camps! This is a sponsored post in collaboration with Mommy In Los Angeles® Magazine and The LA Clippers Youth Basketball Summer Camp Program. All opinions are my own.